Zhang Ziyi, Tony Leung Chiu-Wai, Maggie Cheung and Jet Li in Hero. The Skinny: Much-awaited wuxia is a visually-stunning mixture of art film, martial arts action, gorgeous color and dubious historical accuracy. The film works better in parts than as a whole, and the oversimplified politics could raise the eyebrows of the initiated. 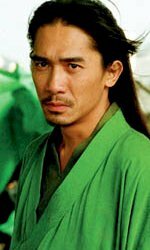 Still, Hero is most definitely worth seeing, if only to make the inevitable Crouching Tiger Hidden Dragon comparisons. Zhang Yimou's Hero could be viewed as a disappointment. Given the international success of Crouching Tiger Hidden Dragon, anything that Hero aspires to will be measured by the yardstick of Ang Lee's Oscar-winning epic. The comparison is understandable, but also unfair. CTHD was a martial arts epic infused with populist emotions; despite whatever epic grandeur the film conjured, it was essentially about people who couldn't express themselves properly. Hero does have its share of emotional baggage, but it's subjugated to the ultimate "message" delivered by Zhang and company. Also, Hero's martial arts are contemplative and without explicit tension, andunlike CTHDseem soley intended to convey emotional states or thematic metaphor. This is not a movie in which to get ripped and start yelling at the screen. Stripped to its core, Hero is essentially an art film. 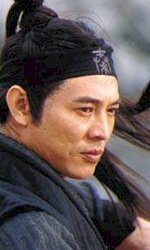 Jet Li plays Nameless, a low-level official in the Qin Kingdom, who arrives at the palace of Ying Zheng (Chen Dao-Ming), the King of Qin. He bears some truly rare gifts: the weapons of Broken Sword (Tony Leung Chiu-Wai), Flying Snow (Maggie Cheung) and Sky (Donnie Yen), three assassins wanted for conspiracy to assassinate the King. China is currently a tangle of warring states, and Ying Zheng desires to conquer the entire country and establish himself as the sole emperor of China. Not surprisingly, that sort of attitude will make you enemies, which is why the King has massive bounties on anyone daring or skilled enough to make an attempt on his life. Nameless has arrived at the palace to claim the rewards, and at the King's entreaty, tells the story of how he was able to subdue the famed assassins. However, his tale may not be entirely true. Thanks to Rashomon-like storytelling, we learn that Nameless' version of events could be colored by hidden motives. The King posits his own version of events, and chooses to implicate Nameless as a possible conspirator to his assassination. That version is in turn refuted by another version of the tale, and so on and so forth, with numerous flashbacks and supposed versions of the events represented through the glorious cinematography of Christopher Doyle. Different versions of the events are highlighted by specific color tones; red designates a more passionate accounting, while blue highlights a version colored by personal loss and sadness. Green, white and yellow come into play too, though to assign meanings and motifs to each and every color scheme would border on presumptuous and didactic. If anything, the different colors work as an effective narrative device that separates the various versions of the tale. On a technical level, Hero is a masterpiece. The costumes, production design, cinematography and martial arts choreography are all award-worthy. Most martial arts fans will be pleased with the work of choreographers Ching Siu-Tung and Stephen Tung Wai, and there are certainly a lot of the scenes to satiate those jonesing for cool swordplay action and fluid choreography. Donnie Yen and Jet Li have a well-staged initial bout, but there are also impressive FX-enhanced shots of our heroes (?) fending off volleys of arrows, and a thrilling assault on the palace as Broken Sword and Flying Snow take on a whole army by themselves. It's epic-level martial arts, which is infused with a generous portion of eastern philosophy. The purpose of all of this is not only to divine the truth behind Nameless' story, but also to explore this question: what is the true nature of heroism? Is it the revenge waged by assassins Broken Sword and Flying Snow, or is it Nameless' attempt to serve his King? Or is everything twisted and hidden beneath the film's narrative layers? Zhang Yimou stages everything like an elaborate costume play. The verbal jousting between the King and Nameless frames all the flashbacks and supposed events. Lots of verbalization, philosophical intuition and acute self-awareness punctuate the dialogue. The battles these characters wage are primarily internal; the action and passionate histrionics are representative rather than expository. This is an involved art film, but the action and Rashmon-like storytelling give it a satisfying commercial edge too. But, when everything is stripped away, what's left? On one hand, Hero works very well as a singular narrative piece which explores and finally answers the true nature of heroism. However, the fact that the story is based on history causes a few problems. The film posits that Ying Zheng's quest to conquer China is as much about protection as it is about tyranny, a version of events that not all historians may find agreeable. Sure, fictional license already exists thanks to the presence of martial arts superheroes, but is it proper to simplify the forces of history into a palm-sized package? The conquering of China's warring states may have created a unified China, but personal and even human freedoms weren't entirely respected in the process. More troubling are the modern political implications of the film's message. There is an obvious nod towards the importance of the greater good. Or, to borrow an axiom from another film genre, "the needs of the many outweigh the needs of the few, or the one." That's a fine message, and Hero does a good job in giving that message emotional and thematic weight. Still, if one were to apply that thinking to modern times, some people (like the Taiwanese) might not be so swayed. And some could even be incensed by what they might perceive within Hero's dogma. An argument against the above is simply that Hero is just a film, and a contemplative action-adventure film at that. That's true; Hero can be enjoyed on a cinematic level for its dramatic storyline, visually spectacular martial arts, and accomplished thematic depth. The acting is also excellent, with fine performances from Tony Leung Chiu-Wai, Maggie Cheung and, most especially, Chen Dao-Ming as the King. If any actor in the film gives real human weight to their performance, it's Chen, who embodies the conflict between personal honor and civic duty in a truly convincing way. 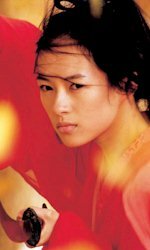 Zhang Ziyi is effective in a rather minor role as Moon, Broken Sword's disciple, and Jet Li's opaque performance is fitting. This is a film that still could satisfy both lovers of art and commercial filmmaking, though perhaps not as universally as Crouching Tiger, Hidden Dragon did. In July of 2004, Guangdong Face Home Video released an "extended cut" of Hero on a Region 0 NTSC DVD. Of course, an extended cut of a film as Internet-buzzworthy as Hero is sure to get fanboys to salivate, but a collective "down boy" should probably be issued before people start hightailing it to Chinatown to pick up the Guangdong Face DVD. The big news is that this is not the supposed 120 minute director's cut that's been discussed on many an Internet forum. This extended version features approximately 10 minutes of extra footage, though not much of it really seems new. And to top it all off, the print and transfer are worse than Hong Kong's Edko disc, and there's even an annoying "FACE" watermark that appears in the upper left-hand corner periodically. That's a couple of strikes right there. But does this 107 minute version improve on the widely-seen 98 minute theatrical cut? Well, not really. Basically, what the "extended" label comes down to is one or two longer scenes and a whole lot of extra atmosphere. Certain fight sequences get padded with extra slow motion, flapping sleeves, flying leaves, and/or midair acrobatic contortionist moves. At the end of the fight between Sky (Donnie Yen) and the Emperor's guard, he gives money to the blind musician. A few extra shots are inserted, i.e., a few more sidelong glances, or a couple more slow-motion shots of Zhang Ziyi or Tony Leung Chiu-Wai on a horse. Extra dialogue occurs at one or two moments, but none of those instances is really a major one. Pacing is made more languid, and less attention is paid to crosscutting time economy. Of the extended scenes, only one really stands out as a major difference. 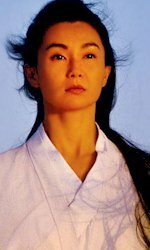 At one point in the film, Moon (Zhang Ziyi) offers up a few words to convince Nameless (Jet Li) that the "all under Heaven" credo of Broken Sword (Tony Leung Chiu-Wai) is a valuable one. In the theatrical cut, Moon simply gets on her knees and tells Nameless to think it over. In the extended version, Moon tries to off herself twice with her swords, whereupon Nameless stops her and lectures her about how she's young and shouldn't die in such a meaningless manner. Woohoo! Zhang Yimou directs an afterschool special. Flippancy aside, the scene is nice because it gives the camera more time to linger on Zhang Ziyi's impressive bone structure. Actual film improvement via that scene's inclusion is debatable. Notes:  In what has become a legendary injustice, the Disney/Miramax consortium has not released Hero in the United States as of February 2004. This is a full fourteen months after it was released in Hong Kong, AND a full year after it received an Academy Award AND Golden Globe Nomination for Best Foreign Language Film of 2002.